ARSLegal, the legal industry's leading software, service and support provider. TruFile Professional is a full case management software for Workers' Compensation and Civil law firms. This software makes it easy to manage your client information, create tasks and calendar schedules, maintain case financial data including billable time, and create document packages including EAMS compliant forms all from one application. Enter client data once and allow TruFile Professional to populate all EAMS and custom designed forms and letters. Predefined EAMS document packages are predefined for easy filing with the DWC. TruFile Professional can automatically update Uniform Assigned Name (UAN) data directly from the DWC website. Create calendar events applied to a client, case or global event with notifications to email and cell phone. Assign tasks to users with notifications to the assignor and assignee. 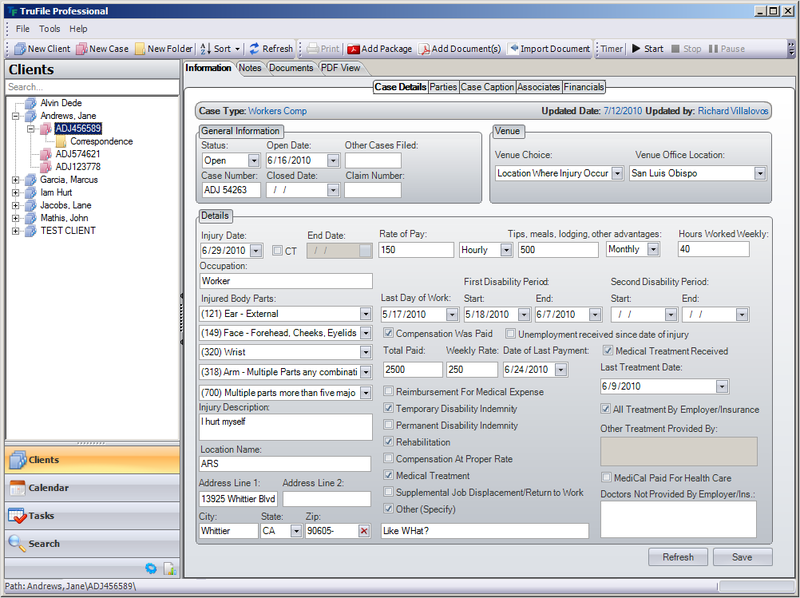 Create case parties such as judge and adjustor that can be assigned to multiple cases. Track financial transactions for a case including the billable time and attorney's fees. Print out detailed case reports for a full case summary. Support for PDF and Docx formats. Can be deployed for use as both a standalone and shared data systems. Save time and money submitting forms and attachments. Eliminate a lof of paper and postage costs. Stay out of the paper queue at DWC district offices. To sign up for the JET File service with ARSLegal, you will need to fill out the JET File Trading Partner Spreadsheet. Instructions for filling out the spreadsheet can be found here. Standard Ethernet TCP/IP WLAN (wireless) infrastructure. For the TruFile Professional client workstation, there is no minimum recommended hardware configuration. TruFile Professional should run capably on any workstation using any one of the operating systems listed above. As is always the case, the better the hardware, the better the performance. Note: The above hardware recommendations are just that, recommendations. TruFile Professional can be run in a more limited hardware configuration, however performance likely will rapidly degrade. Should you wish to run TruFile Professional in a lesser configuration than that recommended by ARSLegal, Inc., please take into account that performance may not be acceptable and the number of additional users that may connect to the TruFile Professional master may be severely limited. Copyright © 2019 ARSLegal, Inc. All rights reserved.